eorge Meredith was as passionate about nature as any of those more exclusively categorised as "Country Writers." Throughout his adult life, until stopped by paralysis in old age, one of his great joys was to tramp for miles along the ancient roads of his adopted home county of Surrey. But his observations went not into letters (like Gilbert White's), reports (like William Cobbett's) or essays (like Richard Jefferies). Instead, they went into his novels and poetry: hence, for example, the title of his 1862 volume of poetry, Modern Love and Poems of the English Roadside, with Poems and Ballads. 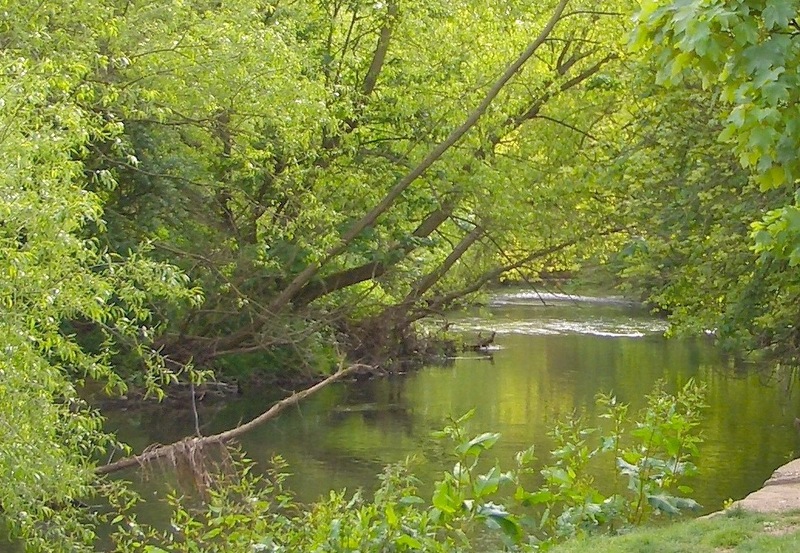 Thus, among the many contradictions and surprises in his work are the quintessentially English settings so often chosen by this most flamboyant and eccentric of writers — complete with the woodland paths, fir knolls, juniper slopes, gravel cuttings, tributaries, Thames weirs and willow-islands with which he was most familiar. Typical Surrey views. 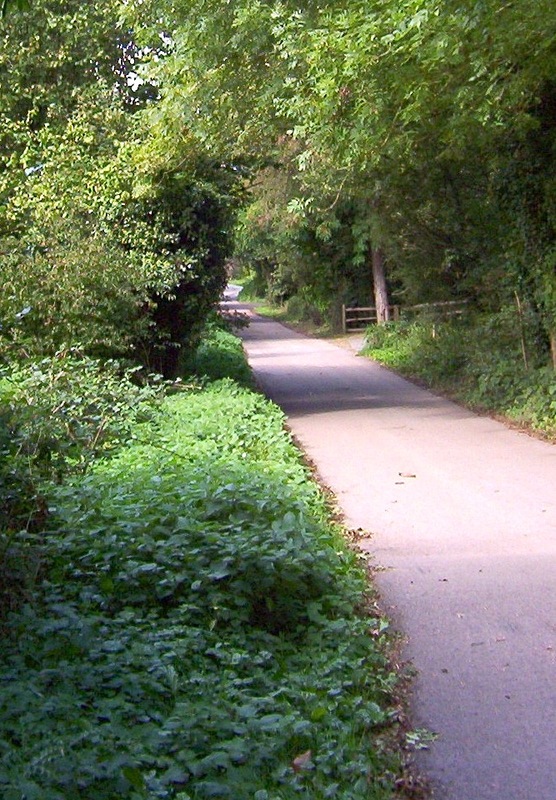 Left: Part of the prehistoric Pilgrim's Way in Compton. Right: The River Mole at Cobham, disappearing in its usual secretive way — "our dear old Muddy Mole" (Letters I: 50). Not, of course, that he confined himself to such local settings. When his friend and admirer William Sharp wrote about "The Country of George Meredith" in his Literary Geography (Vol. IV), he exclaimed: "what a country it is — how wide its domain, how evasive its frontiers!" For all his attachment to the scenery around him, Meredith travelled widely both at home and abroad. Nor are his rural Surrey scenes mere quiet and picturesque backdrops for his characters and their adventures. On the contrary, they are as alive, as fabulous, as exotic, as essential to the breathlessly unrolling narrative as anything else in his work. Left: Duck Eyot, a willow island on the Thames towards Molesey Lock. Meredith was delighted when his good friend and walking companion took a cottage in Molesey. 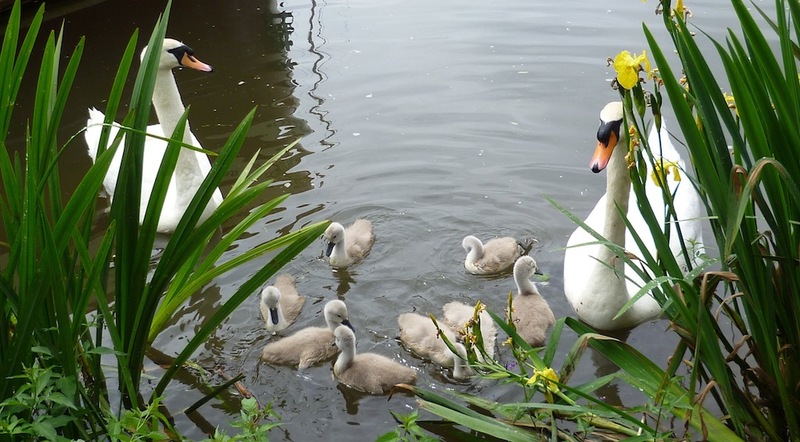 Right: Swans with their cygnets at Shepperton. This is true right from the first outpourings of the 1851 Poems, brimming as they are with young love and drenched with his delight in the recently discovered Surrey countryside, with its waterfowl, wood-pigeons, rooks, mists and so on. Here, the woman whom he loves is so closely identified with nature that she becomes "full of all the wildness of the woodland creatures" ("Love in a Valley"). Later, in the fifty sonnets of the "Modern Love" sequence (1862), feelings in the fraught marriage which he analyses so searingly ebb and flow with the water of the Thames at Shepperton, where Meredith and his first wife lived for a while with, and then just across the green from, his wife's father, the satirical novelist Thomas Love Peacock. The marriage of the unfortunate couple in the poem (based, it would seem, on Meredith's own first marriage) becomes a performance which cannot last, but must end in some great denouement. Yet, poignantly, in the midst of such high emotional drama, the pair can still stroll by the river together on an autumn evening, feeling momentarily at one with each other and nature. Examine Sonnet XLVII. The season, the time of day, the details (including the colours) of the natural scene all reflect and impinge on the relationship at this point. Much is gained too by the expansiveness of the 16-line sonnet. In this connection, the last two lines ("Where I have seen across the twilight wave / The swan sail with her young beneath her wings") add greatly to the poignant tone of the poem. 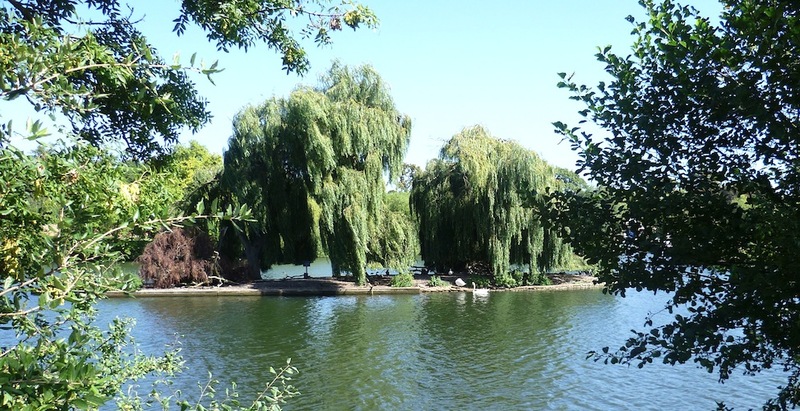 No one who has read this poem can walk along the river at Shepperton, with its several "willow islands," its swans and its populous swallow-roosts — once observed by Gilbert White on his summer visits to neighbouring Sunbury — without imagining Meredith and his first wife walking there in real life. But a little further upstream is the more obviously dramatic sight of Shepperton weir, marked with a "Danger" sign. In The Ordeal of Richard Feverel (1859), the impressionable young hero glimpses Lucy Desborough when boating on a stretch of river with just such a rushing weir. Lucy's surname itself connects her strongly with the area, for the Thames at Shepperton loops round a piece of land called Desborough Island, with the narrow Desborough Channel enclosing it from the other side. Again, the emotional moment is indissolubly linked with the place itself. "Surrounded by the green shaven meadows, the pastoral summer buzz, the weirfields thundering white, amid the breath and beauty of wild flowers, she was a bit of lovely human life in a fair setting," writes Meredith in Chapter 14. As for the heartstruck Richard, "It was the First Woman to him," says the narrator in the next chapter. The effect of this expression, and its capitalisation here, is of course to remind us of the Fall, and the banishment from Eden. A note of tension and foreboding is introduced at the very beginning of the relationship. Moving on, The Adventures of Harry Richmond (1871) was the first novel that Meredith wrote after moving to Flint Cottage, his permanent Surrey home on the lower slopes of the famous beauty-spot, Box Hill. The settings in this novel are again intrinsic to the narrative, and the way Meredith leads us from one to another reflects both the picaresque nature of the narrative, and the hero's difficulty in establishing a sure identity in the course of his "adventures." Gypsies in novels like George Eliot's The Mill on the Floss and Charles Reade's A Terrible Temptation are definite outsiders. Here, the hero is on the boundary, and his uneasy sense of rootlessness is only assuaged at the end by the prospect of marriage to his solidly "landed" English second cousin, Janet Ilchester. At Flint Cottage, Meredith himself was happy to strike root at last in the heart of the Surrey countryside. "Osier-isles" in the Thames, and Sonnet XLVII in "Modern Love"
Meredith, George. Letters of George Meredith, Vol. I. Ed. William Maxse Meredith. 2 vols. London: Constable, 1912. Internet Archive. Contributed by the University of California. Web. 31 December 2015. Sharp, William. "The Country of George Meredith" in Literary Geography (Vol. IV).